Full moon over the steppes - the cattle perched inside the fences - the old herdsman steps out of the ger and fires a bullet into the starlit night. "You see", he turns his head explaining to me, "I just want to chase the wolves away!" - We return to his kinfolk inside, where the Yak-Butter-Tea is steaming on the fireplace. "Have one more cup, before you go to rest!" It tastes salty and sweat in a peculiar way. Later that night, when the outside cold defeated the fading warmth of the fire, I feel somebody covering my body with a fur-coat. Have I come home at last? Have I taken a journey into myself? Next morning, when I squint into the rising sun it's obvious: SKY - EARTH - and myself. That's all there is to experience! The calm spaciousness and untouched wilderness gives me a feeling of being favoured by natural grace. Let me show you this MONGOLIA! 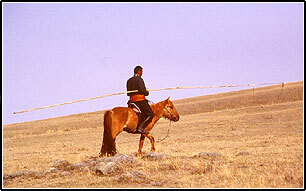 My Mongolia!